The man who walked into Henry's Market, at 803 S.E. 82nd Avenue of Roses, appeared to be intending to buy something at this friendly neighborhood store on the afternoon of June 28. But, when the clerk opened the cash register drawer, the shopper turned into a robber, grabbing stacks of bills before he dashed for the store's door. 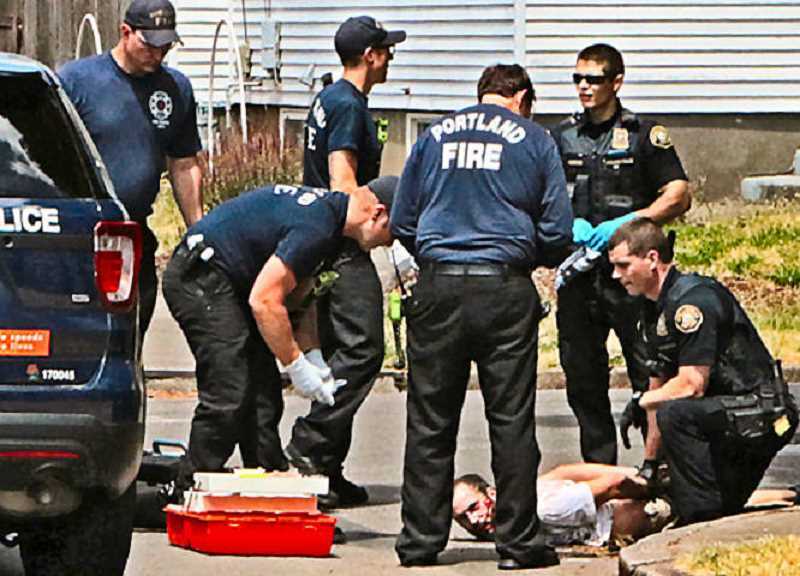 Portland Police Bureau (PPB) officers were dispatched to the area after multiple callers to the 9-1-1 Center reported the incident at 1:13 p.m. that afternoon. But, Joe Rodgers, a co-owner of Growlers Taproom – co-located with the market – saw what was happening, and sprang into action. "The store clerk was shouting at this guy to stop and give back the money," Rodgers said. "I started after him, without thinking of what I'd do if I caught him." He pursued the apparent thief on foot, westbound on S.E. Morrison Street, all the way to Ascension Catholic Church at 76th Avenue. "I got up close to him and said I just wanted to talk with him for a second," Rodgers told East Portland News. About that time, a car driver saw Rogers yelling for people to call 911, and give him a ride, taking him north to the parking lot at S.E. Washington Street Alley and into the Thatcher's tavern parking lot. The suspect then ran south on 80th Avenue, with Rodgers still in foot pursuit. "I love my neighborhood and my neighbors are so good; I saw an older lady raking leaves on her cell phone calling for police; others along the way pointing – with cell phones in hand – shouting 'He went that way' as we followed him," Rodgers recalled. When the suspect ran into the alley south of S.E. Morrison Street heading west, a woman and her daughter stopped their car in the alley, opened their doors, and shouted, "You're not going this way!" By then PPB East Precinct officers, including a K-9 police dog, had arrived in the area of S.E. 80th Avenue at Morrison Street. "A lady came running up her of her house telling police that the guy is in her backyard," Rodgers said. "After telling the guy to stop, the cops sent the dog after him; I guess he didn't believe that police dogs bite." The correct answer: They do. That's how they make an arrest, lacking hands. The man was taken into custody by officers, and then received first aid for dog bites from Portland Fire & Rescue Montavilla Fire Station 19's paramedics, until an ambulance arrived. Apparently, the suspect's hospital stay was brief. "The suspect arrested for Third Degree Theft (a class C Misdemeanor) was identified as 30-year-old Bryan David Mcilvan," said PPB Public Information Officer Sgt. Chris Burley. Mcilvan was booked into the Multnomah County Detention Center (MCDC) at 4:39 p.m. that afternoon. At his arraignment the following day in Multnomah County Court, the judge found that Mcilvan would also face charges for three additional Misdemeanors, including Escape in the Third Degree, Second Degree Criminal Mischief, and Harassment – BMIS DV. Mcilvan is currently lodged at MCDC in lieu of posting a combined bail of $36,000.